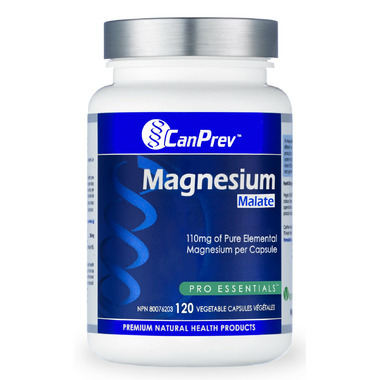 CanPrev Magnesium Malate is a form of magnesium often recommended by naturopathic doctors for improved metabolic and energetic function. Magnesium is essential in over 350 different enzymatic functions in your body, from DNA synthesis and energy production to proper muscle function and nervous system health. This proprietary magnesium complex provides a therapeutic 110mg of di-magnesium malate. Directions: Adults – Take one (1) to three (3) capsules per day or as directed by a healthcare practitioner. Non-medicinal Ingredients: Vegetable-grade magnesium stearate, vegetable capsule. No binders. No fillers.